Apple's $199 iPhone: How Can It Be So Cheap? PR: On Monday Apple introduced the new iPhone 3G, combining all the revolutionary features of iPhone with 3G networking that is twice as fast* as the first generation iPhone, built-in GPS for expanded location based mobile services, and iPhone 2.0 software which includes support for Microsoft Exchange ActiveSync and runs the hundreds of third party applications already built with the recently released iPhone SDK. In the US the new iPhone 3G is priced at a stunning $199 for the 8 GB model, and just $299 for the 16 GB model. ** iPhone 3G will be available in more than 70 countries later this year, beginning with customer availability in 22 countries - Australia, Austria, Belgium, Canada, Denmark, Finland, France, Germany, Hong Kong, Ireland, Italy, Japan, Mexico, Netherlands, New Zealand, Norway, Portugal, Spain, Sweden, Switzerland, UK and the US - on July 11. "Just one year after launching the iPhone, we're launching the new iPhone 3G that is twice as fast at half the price," said Steve Jobs, Apple's CEO. " iPhone 3G supports Microsoft Exchange ActiveSync right out of the box, runs the incredible third party apps created with the iPhone SDK, and will be available in more than 70 countries around the world this year." iPhone 3G gives users ever faster access to the Internet and email over their cellular network with quad-band GSM and tri-band HSDPA for voice and data connectivity around the world. iPhone 3G supports WiFi, 3G and EDGE networks and automatically switches between them to ensure the fastest possible download speeds. The new iPhone 3G also makes it easier to multitask with simultaneous voice and data communications, so with iPhone 3G you can browse the web, get map directions, or check your email while you are on a call. iPhone 3G includes the new iPhone 2.0 software with both the iPhone SDK and key enterprise features such as support for Microsoft Exchange ActiveSync to provide over-the-air push email, contact and calendar synching as well as remote wipe and Cisco IPsec VPN for encrypted access to corporate networks. The iPhone SDK allows developers to create amazing applications that leverage the iPhone's groundbreaking Multi-Touch user interface, animation technology, accelerometer and GPS technology on the world's most advanced mobile platform. iPhone 3G includes the new App Store, providing iPhone users with native applications in a variety of categories including games, business, news, sports, health, reference and travel. The App Store on iPhone works over cellular networks and WiFi, which means it is accessible from just about anywhere, so you can purchase and download applications wirelessly and start using them instantly. Some applications are even free and the App Store notifies you when application updates are available. The App Store will be available in 62 countries at launch. Additional features available with the iPhone 2.0 software include the ability to do real-time mapping and track your progress with GPS technology, mass move and delete multiple email messages, search for contacts, access a new scientific calculator, turn on parental control restrictions for specified content, save images directly from a web page or email them to your iPhone and easily transfer them back to your photo library on your Mac or PC. iPhone 3G delivers an amazing 10 hours of talk time on 2G networks and 5 hours using 3G, with up to 5 to 6 hours of web browsing, up to 7 hours for video playback and up to 24 hours for audio playback. iPhone 3G takes advantage of MobileMe, a new Internet service that pushes email, contacts, and calendars from an online "cloud" to native applications on iPhone, iPod touch, Macs and PCs. With MobileMe email, messages are pushed instantly to iPhone, removing the need to manually check email and wait for downloads, and push keeps contacts and calendars continuously up-to-date so changes made on one device are automatically updated on other devices. With iPhone, you can even snap a photo and post it directly to a MobileMe Gallery to share with friends and family. iPhone 3G will be available in the US on July 11 for a suggested retail price of $199 for the 8 GB model and $299 for the 16 GB model in both Apple and AT&T's retail stores and requires a new two year contract with AT&T for qualifying customers. iPhone 2.0 software will be available on July 11 as a free software update via iTunes 7.7 or later for all iPhone customers. For further information about iPhone 3G pricing and availability in the US and internationally, visit www.apple.com/iphone. **Based on iPhone 3G (8 GB) and first generation iPhone (8 GB) purchases. Requires new two year AT&T rate plan, sold separately. PR: Rogers Communications and Apple on Monday announced that the highly anticipated iPhone 3G will be available in Canada on July 11. iPhone 3G combines all the revolutionary features of iPhone with 3G networking that is twice as fast* as the first generation iPhone, built-in GPS for expanded location based mobile services, and iPhone 2.0 software which includes support for Microsoft Exchange ActiveSync and runs the hundreds of third party applications already built with the recently released iPhone SDK. "Rogers has a long history of bringing Canadians the very best in wireless services, networks and handset innovations," said Rob Bruce, president, Rogers Wireless. "With iPhone 3G, we will provide our customers with an amazing mobile experience over Canada's fastest wireless network." "We're excited to be working with Rogers to bring iPhone 3G to Canada," said Tim Cook, Apple's COO. "We can't wait to get this revolutionary phone in the hands of even more people around the world." 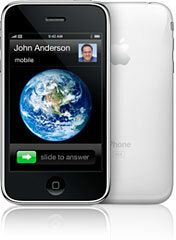 iPhone 3G will operate on Rogers' High Speed Packet Access (HSPA) wireless network, the fastest mobile network in Canada. HSPA is nationally available in the top Canadian urban centers from Vancouver to Halifax, covering more than 60 percent of the population. iPhone 3G will also operate on Roger's coast-to-coast GSM/EDGE network, proven to be the country's most reliable wireless network. More details on pricing and retail availability will be available soon. Rogers Communications is a diversified Canadian communications and media company. We are engaged in wireless voice and data communications services through Wireless, Canada's largest wireless provider and the operator of the country's only Global System for Mobile Communications ("GSM") based network. PR: AT&T Inc. has announced it will be the exclusive US provider of the new iPhone 3G, details of which were outlined earlier today at Apple's Worldwide Developer's Conference in San Francisco. 3G broadband wireless connectivity, which gives customers a home broadband-like speed experience when surfing the Internet, sharing files and using media-rich Web applications. Business-class capabilities, including e-mail, viewed on a large, touchscreen device and designed to meet the needs of companies of all sizes. The ability for developers, including AT&T, to create customized consumer and business applications using the Apple software developer's kit (SDK). Customers can get more information on the iPhone 3G at: http://www.att.com/iphone. AT&T expects that the iPhone 3G's attractive pricing and rich set of features including business e-mail and other applications, combined with the broadband speeds of AT&T's 3G network, will spur significant subscriber and revenue growth - particularly in wireless data - and strengthen AT&T's wireless leadership and long-term growth profile. "The iPhone 3G will take mobile communications and computing to a whole new level by combining a terrific user interface with a great experience accessing the Internet and subscribers' favorite applications on our 3G wireless network at unsurpassed speeds," said Ralph de la Vega, president and chief executive officer of AT&T Mobility. "Combine our high-performance 3G broadband wireless network, the new iPhone's business-class capabilities and a starting price of $199, and I expect that we will continue to increase revenue per user and attract customers who spend the most on wireless. The device is built, and priced, to sell." The new agreement between Apple and AT&T eliminates the revenue-sharing model under which AT&T shared a portion of monthly service revenue with Apple. Under the revised agreement, which is consistent with traditional equipment manufacturer-carrier arrangements, there is no revenue sharing and both iPhone 3G models will be offered at attractive prices to broaden the market potential and accelerate subscriber volumes. The phones will be offered with a two-year contract and attractive data plans that are similar to those offered for other smartphones and PDAs. AT&T anticipates that these offers will drive increased sales volumes and revenues among high-quality, data-centric customers. Currently, less than 20 percent of AT&T's postpaid subscribers have integrated devices capable of voice, Web and data applications. Based on the company's experience, average monthly revenues per iPhone subscriber are nearly double the average of the company's overall subscriber base. With a two-year contract, the price of an 8 GB iPhone 3G will be $199; the 16 GB model will be priced at $299. Unlimited iPhone 3G data plans for consumers will be available for $30 a month, in addition to voice plans starting at $39.99 a month. Unlimited 3G data plans for business users will be available for $45 a month, in addition to a voice plan. The iPhone 3G harnesses the power of AT&T's broad and powerful 3G mobile broadband network, which offers 3G mobile phones download speeds of up to 1.4 Mbps. AT&T's 3G network is currently available in 280 leading US metropolitan areas; by year-end, the company plans to offer 3G service in nearly 350 metro areas. Following the recent turndown of its TDMA network, the company is further enhancing its 3G network, with improved coverage quality made available through reallocated 850 MHz spectrum. AT&T's 3G network is the best positioned among American carriers to grow in line with customer demand, evolving to next-generation speeds incrementally during the next few years. Between 2005 and the end of 2008, AT&T will have invested more than $20 billion in wireless network improvements and upgrades. In addition, the new iPhone 3G will operate in WiFi mode through wireless modems in homes and offices, as well as public hot spots. iPhone 3G includes new business capabilities, including access to corporate e-mail and intranets, as well as the ability to certify mobile business applications to suit the needs of an array of industries, ranging from health care and real estate to higher education and financial services. Starting July 11, AT&T will begin marketing to its business customers, which includes all of the Fortune 1000. To prepare for the rollout, AT&T will be conducting extensive training among its thousands of enterprise and small business sales force and customer-support employees. AT&T is the world's leading provider of corporate wireless e-mail solutions. "We're anticipating significant demand from companies of all sizes based on the feedback we've received from the many corporate customers who have already purchased the first-generation iPhone, as well as from companies waiting for the new iPhone's business applications," said Ron Spears, group president, AT&T Global Business Services. "Businesses will benefit from all of the iPhone's new features, as well as the ability to maximize productivity by using the combination of 3G broadband connectivity and customized applications." AT&T is working closely with Apple to roll out several new and innovative applications that take advantage of the iPhone's advanced capabilities. For example, AT&T is finalizing YELLOWPAGES.COM mobile for the iPhone, an innovative location-based application that combines local search with social networking capabilities, giving users the ability to search for information, share reviews and plan activities with friends, neighbors and coworkers. In addition, the company will work to certify many of its existing mobile applications for businesses, created in conjunction with third-party developers, for use on the iPhone. "Our earlier speculation has been confirmed: iPhone Atlas has learned that there will be no iTunes-based activation for the iPhone 3G. Activation will take place at the time of purchase, either at AT&T or Apple retail stores. This apparently means that there will be no online ordering of the new model, which is due to ship on July 11th." "...both Apple and AT&T are making a big deal about the iPhone 3G being cheaper, Apple with the 'Half the price' tag line and AT&T with its '$199 Starting Price Significantly Expands Mass Market Appeal' line in the press release, along with the bare-faced statement that lowering the initial price will 'accelerate subscriber volumes.' That initial purchase will indeed be cheaper, but anyone who doesn't take the higher monthly fees into account is either being deceived or is just plain stupid. I know it's standard marketing practice to take advantage of the math-challenged with tricks like this, but it still feels underhanded...."
"...SMS messages are no longer included in the data plan either, so you'll have to pay extra for them." "The new iPhone's data plan is $30/mo., or $10 more per month than the old phone's ($20). Over the mandatory 24-month contract you sign when you get the phone, that's an additional $240. Remember that number, we'll need it later." "Apple's announcement of a next-generation 3G iPhone wasn't a big surprise for most people at today's World Wide Developers Conference. But the low prices at which the new models will debut - $199 with 8 GB of memory and $299 with 16 GB - certainly surprised me. "How could a phone with more memory, more radios (3G/GPS technology), and better battery life go for, essentially, a third of what the original cost a year ago? Sure, tech prices go down, but usually vendors hold the line on prices when they add new performance-improving features. "I surveyed a handful of experts to see what they had to say...."
Link: Apple's $199 iPhone: How Can It Be So Cheap? "We've received word that Vodafone in Italy plans to sell unsubsidized iPhone 3G models for 499 euros and 599 euros for the 8 GB and 16 GB models respectively. At current rates, that converts to about $775 and $930 respectively. Vodafone says these models are meant to be used with prepaid plans. "Other carriers, including AT&T in the United States, have yet to reveal pricing for unsubsidized iPhone 3Gs, let alone indicate that they will sell the phones unsubsidized at all. Currently AT&T has only announced that it will sell subsidized phones starting at $199 with two-year contracts." "The new iPhone and the way it will be sold look set to shut down a small industry that arose to make the first version of the iconic phone available around the world. "Apple announced a new iPhone Monday for use on 3G, or third-generation, data networks. It will stem the flow of unlocked phones in two ways." "So, where to begin gearing up the iPhone for use at work? How can you satisfy executive demands to make the iPhone fit for corporate essentials while maintaining security and manageability? For those looking to get a jump on business-enabling the iPhone, here's a handy guide on what's currently possible and how to get it done, as well as what is promised to be supported in the 2.0 software and 3G iPhone due in July...."
"...Apple is once again in the spotlight, and that has everything to do with the iPhone 3G features the company revealed . Should you queue up when the iPhone 3G becomes available on July 11? Read on." "To be sure, the 3G iPhone announced during yesterday's WWDC keynote is a big improvement over the original. But there are still a few detractors to keep certain people away. Here are five reasons explaining why you may want to avoid the 3G iPhone." 2. Lack of other upgrades. "I'll have a full, detailed review of the new 3G iPhone in a few weeks, but here are some first impressions based on Apple's announcement today." "Nothing worse than packing a power adapter that's damn near the size of your actual cell phone. Chalk this one up to the 'little things' that makes people like Apple products; the new iPhone has a tiny, tiny power adapter." "Still, touch owners aggrieved by the $10 upgrade charge may feel happier knowing that the update costs half of what the last one did but delivers more. "But you have to ask, is Apple really so ungenerous it can't take $10 on the chin?" PR: How could anyone improve a book that readers have already dubbed "the iPod Bible" and downloaded millions of times? Popular web site iLounge answers that question and many more in The Free iPod + iPhone Book 4, a brand-new, 268-page encyclopedia of all things iPod, iPhone, and iTunes. Packed with tons of new information, the redesigned and streamlined fourth-edition is iLounge's best publication yet, guaranteed to help readers make the most of Apple's popular digital media products. How could anyone improve a book that readers have already dubbed "the iPod Bible" and downloaded millions of times? Popular web site iLounge answers that question and many more in The Free iPod + iPhone Book 4, a brand-new, 268-page encyclopedia of all things iPod, iPhone, and iTunes. Packed with tons of new information - including some life-changing news about its creators - the redesigned and streamlined fourth-edition is iLounge's best publication yet, guaranteed to help readers make the most of Apple's popular digital media products. It is available for immediate download from the main page of iLounge. "As fantastic as they are, iPods and iPhones no longer include detailed manuals or software," explained Jeremy Horwitz, Editor of the Book and iLounge, "so we created a one-stop, comprehensive guide to virtually everything you can do with them. Whether you're looking for help, free music or videos, the latest accessories, or the resale value of your used iPod or iPhone, the Book has what you need, and much more." Sneak Peeks: The Book includes exclusive world premieres of over 20 new iPod and iPhone accessories, including new speakers from iHome, earphones from Etymotic and Scosche, in-car accessories from Monster Cable and Griffin Technology, and cases from some of the world's top designers. All Things iPod, iPhone, and Apple TV: Split into 16 sections that cover the full lifespans of Apple's media devices - from purchase and initial connection to use, repair, and eventual sale - this massive guide also helps users learn how to fill, customize, and accessorize these devices. With newly expanded parts on choosing earphones, finding iPhone-compatible car accessories, and creating device-optimized videos, the All Things guide now also contains direct links to the iLounge.com website for additional, personalized assistance. 150 iTunes Answers: Completely reorganized and updated for the latest version of Apple's iTunes digital media software, 150 iTunes Answers now offers a full 100 pages of helpful tips and pictures. Starting with how to transfer an iPod's or iPhone's contents back to your computer, then including special sections on the iTunes Store, maximizing sound quality, and much more, 150 iTunes Answers now can be read from front to back or as individual tips from a master index. The Next-Generation iPhone and Photo Galleries: Beautiful photographs and images submitted by iLounge readers depict the past, present, and future of Apple's iPhone family, as well as the latest globe-trotting iPods. "The Free iPod + iPhone Book 4 is a necessary read for users of Apple's media players," said Dennis Lloyd, Publisher of the Book and iLounge. "We've overhauled every single page of last year's edition for easier viewing on desktop, laptop, or pocket-sized screens - you can even read this Book on your iPhone or iPod touch. By making this incredible publication available as a hassle-free download, we continue our mission of providing the world's iPod and iPhone owners with the best possible information, free of charge." Downloads of The Free iPod + iPhone Book 4 in the popular Adobe PDF format are available now from the iLounge. iLounge's famous 2008 Buyers' Guide and past editions of The Free iPod Book can also be downloaded for free. PR: crispSofties has released version 4.0 of it's unique-featured "iPod.iTunes" synchronization software. iPod.iTunes 4.0 synchronizes songs, videos, playlist and meta data in both directions between iPods and iTunes libraries. Suppresses iTunes' own iPod synchronization with one click, to avoid the deletion of the iPod you want to transfer from. Synchronization, so only missing content is created, without duplicates of files and playlists. Simple to use, including active guiding. Keep songs/videos and playlists on different Macs and iPods up to date. Do a full restore of songs, videos and playlists from iPod - i.e. after a hard disk failure or if you buy a new Mac. Revert accident deletion of songs, videos and/or playlists in iTunes, if these are still on your iPod. Transfer an iTunes library from one Mac to another via an iPod. Synchronize to a "foreign" iPod (not linked/synched to your iTunes library) without deleting content on it like iTunes does. Clone an iPod (see the application's Help menu). Backup an iPod. (see the application's Help menu). Support for iPhone / iPod touch with applied jailbreak. iPod.iTunes now keeps the user entirely free from fiddling around with the right iTunes- and iPod Settings. iPod.iTunes did this already for years regarding the right iTunes Settings. Now iPod.iTunes also makes sure that iTunes cannot delete what you want to transfer from the iPod back into iTunes. iPod.iTunes will inform about the current iPod connection state and, if necessary, with a single click you can ensure that nothing will be deleted by iTunes' automatic iPod synchronization when you connect your iPod. Meta data: iPod.iTunes now supports every possible iTunes meta data for songs and videos. Application Update: Even simpler than before. If a new release is available you get a message from which you can directly choose to update iPod.iTunes with a single click. Help: In addition to the help tags for the interface elements there are now on every tab (and some dialog panels) help buttons, pointing to appropriate manual pages. iPod Eject button: To avoid corruption of iPod's in disk mode it is required by OS X to properly eject the iPod's disk volume before unplugging the cable (just like any other hard drive). This can be done directly from within iPod.iTunes now. Many little user interface Improvements. Many other internal improvements and little bug fixes. The color of the application icon has been changed to white/blue. A demo version is available so you can try before you buy (the demo skips some content during synchronization). One license is 24.90 Euro (about 39 ). There is currently a special "Friendpack"-offer running where an additional full license cost only 7 Euro. This update is, like all updates in the last five years, free for all registered iPod.iTunes version 2.x/3.x customers. PR: Make Your Day Media has announced availability of its new time management application, RemindYou, for the Apple iPhone. RemindYou is a simple, yet powerful application which turns the iPhone into a time management dynamo by significantly increasing access to the user's appointment schedule. RemindYou synchs iCal, Outlook, or Entourage events to the lock screen of the iPhone and displays upcoming appointments every time they use the phone. "Everyone is familiar with Apple's commercials showing the iPhone being answered with the swipe of a finger. That screen, a picture of the earth from space, is perhaps the most viewed, under utilized screen on the iPhone - it is seen every time the phone is unlocked - literally dozens of times a day for the average user. RemindYou retrieves the owner's appointment schedule and overlays it onto that screen," said Make Your Day Media, CEO, Benjamin Shell. "Once installed, you begin to rely upon your iPhone for your appointment schedule, something you can not do easily without RemindYou. It's addictive and can literally change the way you use your iPhone. It becomes second nature to glance at your schedule every time you unlock the iPhone to answer a call, check your email, or browse the web." "You'll never miss another meeting, conference call, or soccer game because you forgot to check your appointment schedule. RemindYou's effectiveness lies in its simplicity," said Shell. Show appointments 6 weeks away. RemindYou is available to everyone as a free download with a 14-day free trial and a lifetime license can be purchased for only $19.95, which includes all RemindYou features. Until available in the new Apple iPhone 2.0 App Store, RemindYou is a native iPhone application published for "jailbroken" phones and can be installed under the "Productivity" category of Installer.app. PR: Plum Amazing has announced their first applications, Plum Caddy for the iPhone and iPod touch and Plum Record for the iPhone. They will be available as soon as the iTunes AppStore comes online. Plum Caddy is the first golf mapping and scoring application for the multi touch platform found on the iPhone and iPod touch. Plum Caddy can be used on any golf course in the world to track strokes, putts and other golfing statistics. Plum Caddy provides an attractive and intuitive interface for keeping track of your score, as well as the locations of each shot. The user can use the touch interface to place where their shot went on a map of the hole and track the number of strokes and other statistics. By remembering every shot on every hole on every course ever played, Plum Caddy provides the golfer with instant historical information, such as club used and location of any shot. Much more coming in the future. Plum Record is an audio recording application for the iPhone. Plum Record will allow users to record any sound, lecture, music, dictation (medical, legal, etc. ), nature sounds, notes, and reminders. While recording audio (not telephone conversations), the user can annotate with text and pictures (taken by the camera). Later the recordings can be played back and the annotations viewed. Plum Caddy and Plum Record will be available for iPhone and iPod touch as soon as the iTunes AppStore opens. Please visit the website to get on the list to be the first to hear when these applications are available and to learn more. PR: Ifbyphone, the telephone application platform company, today announced the new Ifbyphone Voice Broadcast application for Apple iPhones. Ifbyphone's Voice Broadcast application for iPhones enables users to send recorded messages to as many recipients as they wish without using any of the users' calling-plan minutes. The Ifbyphone telephone application platform delivers the broadcasts either immediately, or at a future scheduled time. The new Ifbyphone application will work with any iPhone running the v2 software, both the original iPhones and the highly anticipated new version. In addition, the Voice Broadcast feature will also work with the iPod touch, providing access and capability to a wider audience. "Sales professionals and others are sure to find this new capability invaluable," said Ifbyphone CEO Irv Shapiro. "For example, a sales manager who is leaving town can now schedule a voice broadcast to go out to his or her sales team while away. What's more, this is an ideal application for Mom or Dad. With a couple of clicks, they can send messages to everyone in the family." Select the Ifbyphone Voice Broadcast application on the iPhone. Select the group of recipients from the iPhone's Address Book and enter the delivery date and time. The Ifbyphone service then calls out to the iPhone so the message can be recorded. The call-back recording feature allows users to schedule messages even if they are outside of WiFi range, since the voice message is recorded on the voice side of the network. On the iPod touch, the user will select the phone number of a phone he or she wants to be called on to record the message with Ifbyphone. "Since the voice broadcasts are delivered by the Ifbyphone telephone application platform, no iPhone calling-plan minutes are used, nor is there any requirement for the iPhone or iPod touch user to be online at the scheduled delivery time," Shapiro said. The Ifbyphone iPhone Voice Broadcast application and the enhanced Ifbyphone Voice Broadcast API (Application Programming Interface) will be available to users and developers starting July 1. The application is free, but requires an active Ifbyphone subscription. In addition to the iPhone application, Ifbyphone also announced the release of an enhanced Voice Broadcast scheduling API. This new API supports the integration of voice broadcast messaging into any contact management or CRM solution and provides much of the core functionality of the Ifbyphone iPhone Voice Broadcast. PR: Marware Inc. announces the CEO Sleeve for the Apple iPhone 3G. The CEO Sleeve is a slim, attractive leather sleeve that combines elegant protection and quick access to the iPhone 3G. This case is uniquely designed to appeal to the more discriminating, style-conscious wearer. Marware Inc. announces the CEO Sleeve for the Apple iPhone 3G. Constructed of soft Nappa leather, this sleeve works well on a belt or in a purse or bag. The elastic siding provides a snug fit, while the open top provides quick and easy iPhone 3G access. Marware's patented Multidapt® low-profile belt clip is comfortable, convenient, interchangeable, and removable. Open top design allows full access to the headphone minijack and sleep/wake button. The CEO Sleeve is available in black perforated Nappa leather with contrast stitching. It retails for $24.99 and is available now for pre-order online (shipping prior to July 1, 2008). Please check marware.com for updated shipping dates. Marware is a leading provider of case solutions for Apple iPhones, iPods, Notebooks, and Software. PR: Marware announces its latest leather holster case for the Apple iPhone 3G, the CEO Premiere. The CEO Premiere is a stylish, premium leather hip case for iPhone 3G. This classically designed case features textured, perforated leather with elegant contrast stitching and an ultra-slim permanent belt clip. Marware Inc. announces the CEO Premiere for Apple iPhone 3G. Constructed of soft textured Nappa leather, this versatile case can be worn on the hip or slipped into a purse or bag. The secure magnetic flap holds the iPhone 3G safely in place when not in use, while the opening on the bottom allows the iPhone 3G to be easily pushed out of the case when needed. Side openings allow access to headphone minijack and sleep/wake button, without obstructing the speakers. The CEO Premiere is available in black smooth Nappa leather. It retails for $29.99 and is available now for pre-order online (shipping prior to July 1, 2008). Please visit marware.com for updated shipping dates. Marware is a leading provider of case solutions for Apple iPhones, iPods, Notebooks, and Software. 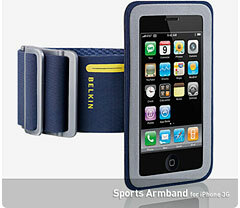 PR: New Belkin cases offer greater protection for your new iPhone 3G, while giving you full access to widescreen touch controls. Cases fit a variety of lifestyles whether you are a workout buff or a road warrior. July 2008 in the US with launches in Europe, Asia, and Australia to follow soon after.